Above, Katie Cannon lectures on racial and sexual inequalities in the south in the 1950s. Photo by Sean Sonnemann. Titled “Zora Neale Hurston: Telling a Truth that Alters the World,” Cannon’s story told of a “trial that shook the foundations of racial apartheid in Florida.” In 1952, Ruby McCollum, an African American woman, was charged with the murder of a sexually abusive white doctor who had forced her to carry his child. Hurston, a notable African-American author and activist, covered the trial on behalf of the national black newspaper The Pittsburgh Courier. Described by Cannon as a “prophet and genuine truth-teller,” Hurston worked to expose the “bizarre absurdity” and “calibrated corruption” surrounding the McCollum trial. These injustices were representative of the larger racial and sexual inequities of the 1950s American South. Although regular lynching and explicit racial segregation no longer take place, Cannon argued that the story of the trial is a “modern day parable” that remains pertinent today. The recent racially charged deaths of Florida teenagers Trayvon Martin and Jordan Davis hold many important “commonalities and differences” to the McCollum trial that was held 62 years ago. Cannon’s lecture last Wednesday was a part of the Judith Plaskow Lecture on Women & Religion, an annual guest lecture on the subject of religion and its relationship with gender, multiculturalism and globalization. The event honors MC professor emeritus of religious studies Judith Plaskow. Plaskow, also in attendance for the event, is recognized as an important scholar with over 40 years of experience in the fields of Jewish feminism and feminist religious studies. The two women are not only both widely respected colleagues, but also personal friends. “She is a woman of many firsts,” Plaskow said when introducing Cannon. Cannon holds the distinction of being the first African-American woman ordained in the United Presbyterian Church and the first African-American woman to earn a doctor of philosophy from Union Theological Seminary, among other numerous honors. 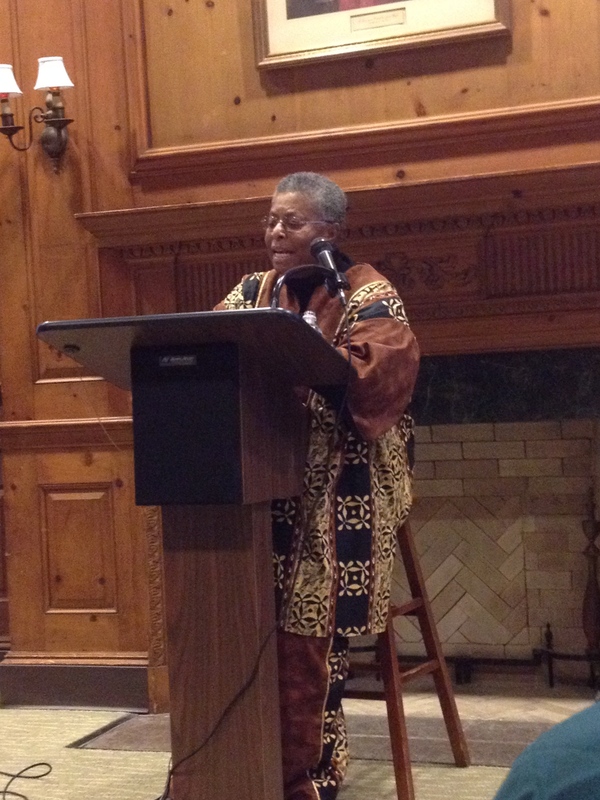 Although a distinguished scholar, Cannon captivated the crowded audience of students and religious studies faculty members with her poetic storytelling and humor. Frequently, she used repetition to emphasize key points of her talk. At the end of her formal lecture, Cannon also opened the floor to questions from the audience. “Now it’s Q and A. I test you to see if you got it right,” she joked. Cannon fielded inquiries regarding the biography and cultural importance of Hurston, the impact of social media on recent trials compared to standard coverage of McCollum’s court case and the historical relationship between the black church and social justice. When asked by one audience member to evaluate how much race and religious relations have changed since the McCollum trial, Cannon pointed to the significance of her very own presence at Manhattan College – a black protestant woman speaking in a guest lecturer spot named after Jewish theologian at a Catholic college. Cannon’s academic and cultural clout was something not lost on the religious faculty members in attendance, including professor Kevin Ahern. “In the world of religion, she’s a beacon. It means a lot for her to be here,” he said. While her lecture detailed a pivotal historical event and touched on complex topics of race and religion, Cannon asserted that her message is a simple one. The pamphlet handed out during Katie Cannon’s lecture. Photo by Sean Sonnemann.